Global automotive supplier DENSO Corporation will begin a ten-month field test of its wireless battery charging system in Toyota City, Aichi Prefecture, Japan. The field test is intended to identify any potential operational issues and also look at ways to enhance the convenience of wireless charging. The field test will begin on Feb. 24 and end in December 2014. When there are two coils apart, electric current can flow through one coil by applying electricity to the other coil. The wireless charging system uses this mechanism to wirelessly transmit power from a power transmission pad on the ground to a power-receiving pad equipped on a vehicle. 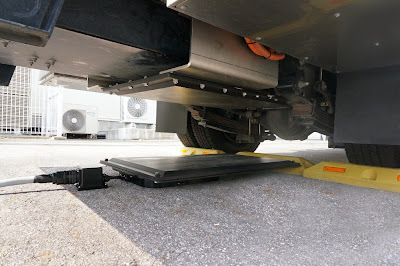 For the test, DENSO has equipped a Yamato Transport delivery truck with a power receiver that will wirelessly receive the energy from a power transmission pad located on the pavement of a 7-Eleven convenience store parking lot. The electricity charged in the truck’s battery is then used to power the refrigeration system while the engine is stopped during pickups and deliveries. Not only will the system improve convenience, but it will also help reduce emissions of refrigeration trucks since the battery will continue to power the refrigeration system even when the engine is off. DENSO has been developing the wireless charging system with the goal to commercialize by 2020. DENSO is working to reduce the size, weight, and cost of the system while also looking to enhance convenience. In Japan, Toyota City is designated as an experimental city for next-generation energy sources and social systems, a program which has been promoted by Japan's Ministry of Economy, Trade and Industry since April 2010.